This post contains compensated affiliate links. Read more in our disclosure and editorial policy here. We were lucky enough to spend several days of our transformational travel trip to Costa Rica at the beautiful Rancho Margot. Located in El Castillo, about an hour’s drive from La Fortuna town and a short walk from Lake Arenal, Rancho Margot is an example of off-grid living and sustainable farming in Costa Rica. Rancho Margot is an eco lodge, a yoga retreat, a permaculture and sustainable farming project, and a place to go back in time. To a time when we lived more simply. To a time where we weren’t surrounded by chemicals. And to a time where connectivity with our surroundings was more important than our wifi speed. 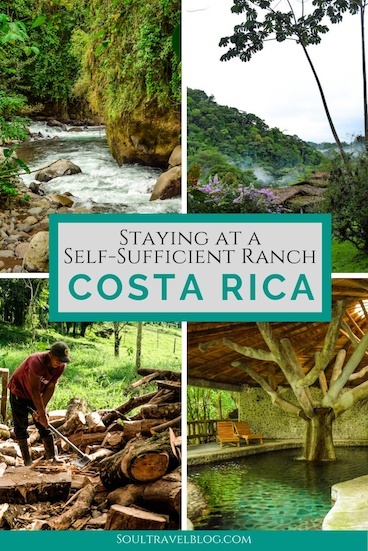 The ranch is also a living school, and volunteers come from around the world to learn more about the sustainability practices in place at Rancho Margot Costa Rica – for a few days, weeks or even months. The idea is to spread awareness of real solutions to reduce our carbon footprint around the world. Rancho Margot was recognised as the first carbon negative company in Costa Rica in 2012 and is one of the pioneers of ecotourism in the country that first made the concept famous. Guests from all around the world come to stay at Rancho Margot, which is set within easy reach of Arenal Volcano (there are great views of Lake Arenal and the Volcano from the top of one of the hills on Rancho Margot. Rancho Margot offers two types of accommodation: The communal bunkhouse for those on a budget, and bungalows for those wanting more privacy and a higher-end experience. Don’t come here expecting TV’s and Air Conditioning: Bungalows have been carefully designed to make the most of natural ventilation and shade – with netted windows which you keep open at night to fall asleep to the sounds of the jungle (without the jungle coming into your room). Rooms are cleaned with organic cleaning products and soaps (provided in bathrooms) are made on property, and furniture for the rooms is carpentered on property (there is a carpentry team that use fallen wood and wood especially grown on site for this purpose). Bungalows come with balconies and hammocks – the perfect spots to relax, read a book and just soak up the sights, sounds and colours of the Costa Rican Jungle. Room rates are full-board and include breakfast, lunch and dinner buffets as well as twice daily yoga and a ranch tour. You’ll likely eat most or all of your meals at Rancho Margot during your stay, for two reasons: Firstly the food at Rancho Margot is largely organic and totally sustainable and Secondly: There aren’t local restaurants or Sodas within walking distance. To start with we noticed the food tasted a little different to what we were used to. Suddenly it dawned us that was because we are used to food with addictive chemicals added, too much salt, and too much flavouring. The food here is pure, healthy with no nasties added. Between 50% – 75% of the food served to guests and staff is grown on site – which means there’s a guarantee of seasonal food hand produced without pesticides. The remainder of food is sourced as locally as possible with no artificial products brought in – even the tomato ketchup is handmade at Rancho Margot! Food served is a mix of Costa Rican with western treats thrown in – think rice beans and eggs for breakfast with delicious seasonal fruit, and the odd organic pizza treat for dinner! One of our favourite areas of Rancho Margot was the Yoga Shala which backs on to one of the ranch’s rivers. Practising sun salutations to the sound of rushing water has got to be one of the most cleansing and healing experiences of our time in Costa Rica. Twice daily yoga lessons are included in room rates, and we recommend you take advantage of them. Yoga retreats are often held at Rancho Margot, too – you can contact the ranch to find out more about upcoming dates. Next to the Yoga Shala is the Library – a space to get cosy with a book and write, draw, read on the deck overlooking the pond with whatever inspiration conjures up. One of the best things about staying at Rancho Margot, is you don’t have to worry about filling your day with activities or finding things to do. The best thing to do here is to relax and soak up the surroundings and enjoy the Costa Rican rainforest. Co-owner, Juan, leads ranch tours where you can see the farm operations, soap making, and learn more about how Rancho Margot achieves its carbon negative status. You can hike up to the viewpoint to look out over Lake Arenal towards Arenal volcano and the national park. There are natural pools for swimming (both indoor and outdoor), as well as plenty of spots to wander along the river, streams and paths through the ranch. If you want to get a taste of some of the adventure tours and activities in nearby La Fortuna, we highly recommend Desafio Adventure Company who we experienced the Lost Canyon with. You can also arrange tours to Lake Arenal through Rancho Margo and enjoy SUP or kayaking on the lake, hiking or horse riding. Looking for more Costa Rica travel suggestions? Read our guide to the best Eco Lodges in Costa Rica here! On our tour of the ranch we learned a lot more about the operations behind Rancho Margot and what makes this eco lodge so special. When Owners Juan and Liz bought the land, it was mainly sparse and empty, with little forestation. Part of their objective ever since has been to re-wild and re-forest it, and today there is not only more vegetation but more biodiversity compared to when they arrived. The permaculture and sustainable farming operations cover an array of products from vegetables, fruits and herbs, to pig and cattle farming, and the ranch has its own dairy too. Wildlife is raised in an ethical way, free from antibiotics and pesticide filled food, and are fed on a vegetable vs grains diet. Currently between 50% to 75% of all food served at Rancho Margot (both staff and guests) comes from the farm – The goal is to become 100% self sufficient and provide all food for guests from what is grown and raised on site. Throughout our ranch tour, Juan shared some of the Ranch’s biggest challenges and opportunities – from how to manage the carbon footprint and expectations of guests when running a lodge such as Rancho Margot, as well as the desire to cultivate more of a permanent community that are committed to self-sufficient living around the ranch. His comments were thought provoking – that stress is caused by what we are doing to our planet, for example. The ranch is fully sustainable in terms of its electricity and energy consumption too, with electricity being produced through both hydro and solar equipment on site, as well as compost generated heat for hot water for some of the bungalows. There is a complex system of both composting – which goes directly back on to the farm – and bio-digesters which treat the liquid animal waste through anaerobic bacterial action producing methane gas for use for cooking and heating in the kitchen. Pig Farming at Rancho Margot – some of the happiest piglets we’ve ever seen! Staying at Rancho Margot is a treat in many ways, but perhaps most of all for the opportunity that it gives to sit back and reflect. As we saw the examples of sustainable communal living laid out before us and tasted the difference between pure food (compared to what we get back home) we started to question: What do we really need in life? As we’ve travelled we’ve observed in general that we don’t need much to be happy. Rather we need the warmth of the sun, fresh oxygen and breeze, fertile nature, good food and time outdoors. Rancho Margot gives you all these things, and more. Space to just be, and learn. After all the things that we actually need – from the sun to fresh oxygen, to pristine nature are all under extreme threat. The only thing we can do to preserve them is question ourself as to what do we really need: And take action in our own lives accordingly. Book your stay at Rancho Margot here. Have you experienced off-grid living? What have you learned in the process? Let us know in the comments below! Editorial: Our travel to Costa Rica was hosted by the Costa Rican Tourism Board as well as our organisers Desafio Adventure Company, Blu Butterfly Events, and Toby Isreal Facilitation to discover more about Transformational Travel in Costa Rica. What an amazing place! We’d love to stay there when we get to Costa Rica. Love their leadership in off grid living and natural foods.